The summer of ’96 was hugely important for German football and the nation as a whole. With the honeymoon period of reunification gone, Germany faced difficult circumstances regarding the East’s continued economic and political integration. Almost mirroring this, the German football team had declined since the euphoria of the 1990 World Cup victory. However, Euro 96 acted as a reprieve. Against the odds, a dogged squad made up of both East and West triumphed. As captain Jürgen Klinsmann sang ‘Football’s Coming Home’ at the Frankfurt homecoming celebrations, there was a feeling of renewed optimism. More than coming home, football had helped unite a nation. The future appeared bright as Germany became World Champions at Italia 1990. Franz Beckenbauer was the man who had masterminded the victory. Despite stepping down as manager afterwards, he was confident Germany could go on to dominate, especially with the added talent pool of players from the former GDR. He claimed Die Mannschaft could “probably be unbeatable for years”. It seemed his successor was just the man for the moment. Berti Vogts was a German legend, winning 96 caps for the national team as a gritty and industrious defender. Along with Beckenbauer, he was a part of the team that won the 1974 World Cup on home soil. He had a decent start to his tenure as manager. Germany reached the final of Euro 92 in an assured manner. However, they came unstuck in the final against underdogs Denmark. It was one of the great upsets and seemed to leave deep scars in the German footballing psyche. Two years later, Germany would crash out in the quarter-finals of the World Cup to Bulgaria. The German team had lost its aura. Vogts became the scapegoat, and he faced fierce criticism going into Euro 96. There is no doubt that the squad that went into Euro 96 was weakened by circumstances. For one, many members of the team that triumphed in 1990 had retired, such as Rudi Völler and Klaus Augenthaler. Vogts was further hindered by a string of injuries and suspensions during the tournament. Captain Jürgen Klinsmann was suspended for Germany’s tournament opener, and also missed the semi-final through injury (he was rushed through to play in the final). Replacement captain Jürgen Kohler hobbled off after just 14 minutes of the opening match with a tournament-ending ligament injury. Midfielders Steffen Freund and Andreas Möller both missed out on the final (through injury and suspension respectively). Midfield enforcer Dieter Eilts was also stretchered off in the final. Come the final, Vogts was in serious danger of not having enough eligible players. Rumour has it that reserve keeper Oliver Kahn was handed an outfield kit for the worst case scenario. Despite the troubled preparations for the tournament, Vogts managed to mould a system that got the best out of the team. He used a 5-1-2-2 formation, which ensured defensive stability, and the ability to quickly turn defence into attack. The lynchpin of this was the former GDR international Matthias Sammer. A classy ball-playing sweeper, he worked well with centre-backs Thomas Helmer and Markus Babbel to create a formidable back three. Sammer was also able to launch attacking moves, executing clever passes to the roaming forwards Klinsmann and Stefan Kuntz. The system paid dividends. Germany started the tournament with a comfortable 2-0 victory over the Czech Republic with goals from Christian Ziege and Andreas Möller. They were equally impressive in their next match against Russia. Captain Klinsmann returned from suspension and scored a brace in a 3-0 win. Already assured top spot in the group, they then played an Italian team who needed a victory to progress. Sammer and his defence were immense, though. The Azzurri couldn’t break Germany down. A 0-0 result sent the Italians home. 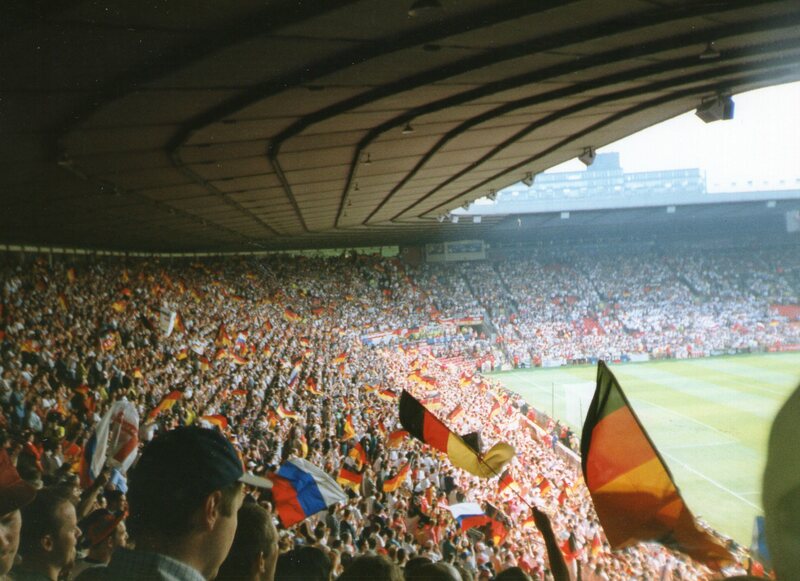 The Germans then travelled up to Manchester for their quarter-final clash. High on confidence, they nevertheless faced a tricky Croatian side. Croatia boasted talents such as Sevilla striker Šuker, and they dismantled defending champions Denmark in the group stage. Germany started well against Croatia. Klinsmann converted a 20th minute penalty to give them the lead. Croatia fought back, though. Šuker equalised in the second half, and the Croats were now threatening to take the game. It was fortunate for Germany that Croatian centre-back Štimac was sent off in the 51st minute. Germany capitalised, with Sammer popping up to net the winning goal. Running on the adrenaline of the crowd, England took a 3rd minute lead thanks to Alan Shearer. The Germans showed fighting spirit, and Kuntz equalised 13 minutes later. The match was pulsating, and the Germans had to put on a rear-guarded display. In truth, they rode their luck at times. England squandered some clear cut chances. Gascoigne was inches away from an open goal tap-in that would have given England a Golden Goal victory. The Germans bravely hung on to force a penalty shootout. Predictably they triumphed, with Möller scoring the deciding penalty. The climax was a replay of Germany’s opener against the Czech Republic. Having won on the first occasion, the Germans were slight favourites. However, injures and suspensions had piled up. The Czechs had also impressed in the tournament, and boasted world class players such as Karel Poborský. It was the Czechs who took the lead in the final. Patrik Berger dispatched a second half penalty. The Germans once again had to dig deep to muster a fight back. Vogts, to his credit, brought on Udinese striker Oliver Bierhoff as a substitute. It paid off instantly. Bierhoff headed in an equaliser in the 73rd minute. He then scored a famous Golden Goal in extra time to clinch the title. Germany had won their third European Championship in the most dramatic of circumstances. Unfortunately, Euro 96 proved to be the only success of the Vogts era. Croatia would humiliate the Germans in the quarter-finals of the World Cup two years later. The Germans continued to struggle until the latter end of the next decade. For this reason, Vogts’ reign is often seen with disdain, his victory in 1996 attributed to luck rather than managerial nous. For all his faults, Vogts’ achievements at Euro 96 should not be underestimated. That summer, he found a winning formula out of adversity to engineer an improbable victory.